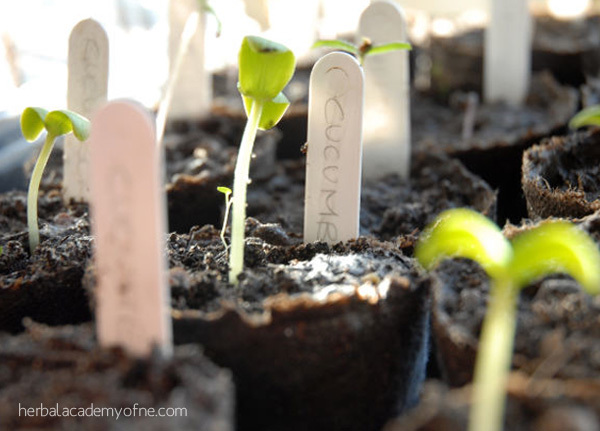 After your seeds have germinated, you need to wait until the first set of 'true' leaves appear before planting out the seedlings. Now, if you look at the pot of seeds here, you will see that there are seedling leaves - a pair of plain leaves - and a pair of crinkly leaves. 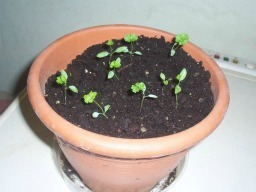 The seedlings are parsley and you will recognise the 'true' leaves, the crinkly ones. This is the stage that you need to plant on into individual pots for the parsley to put on some root and growth before you put it in its final space. The term gardeners use is 'potting on'. Take your plant pot and put a handful of stones in the bottom – about an inch or two is enough. You can use anything that isn’t toxic – broken crockery, stones, bricks, slates, pebbles from the garden or beach. This will let the water drain away so that the soil itself is not waterlogged. The stones will prevent the soil from blocking the drainage holes in the bottom. Fill the pots to the brim with compost, tap and shake to pack it all down. Once again, water the day before transplanting to give the soil time to drain and come to room temperature – plants don’t like ‘cold, wet feet’. Gently loosen the soil around the seedlings in their tray with your dibber. Make a hole in the compost in your pot and, holding the seedling by its seedling leaves – not the stem or true leaves – lower it into the hole. Using the dibber push the soil gently round the roots of the seedling – it is important that there are no air pockets. Give the pot a gentle tap and shake to help the soil settle – firm the surface again with your fingers. After this, you need to leave the pots in the shade for a day or two to recover from their transplanting. If you’re growing herbs indoors, then I would put two or three plants in a pot for herbs like basil, parsley, coriander – things that I’m going to be cutting quite often. I like to keep a few indoors during the winter - basil is always on my kitchen windowsill. If they outgrow the pot, you can always re-pot them singly.